—Productive National Meeting in Mexico! 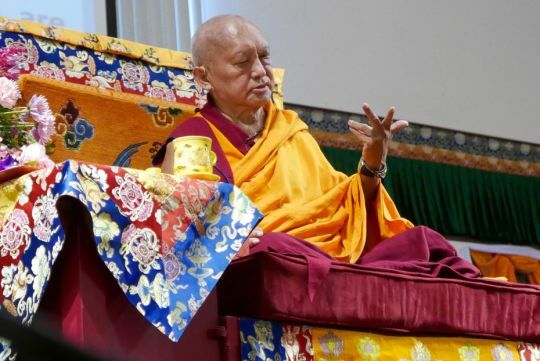 Khyongla Rato Rinpoche and Lama Zopa Rinpoche, Tushita Meditation Center, Dharamsala, India, February 2019. Photo by Ven. Nicky Vreeland. We make recordings of Rinpoche’s recent teachings always available to you at Rinpoche Available Now. 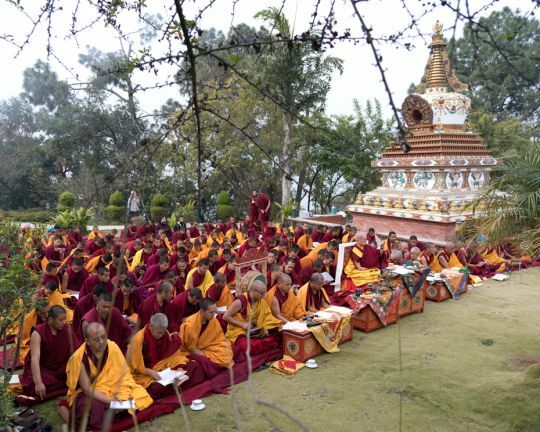 Lama Zopa Rinpoche and monks doing incense puja, Kopan Monastery, February 2019. Photo by Ven. Lobsang Sherab. Lama Zopa Rinpoche teaching at the Light of the Path 2016 retreat, Black Mountain, North Carolina, USA, August 2016. Photo by Ven. Roger Kunsang. Subscribe to our FPMT news blog to get regular news. 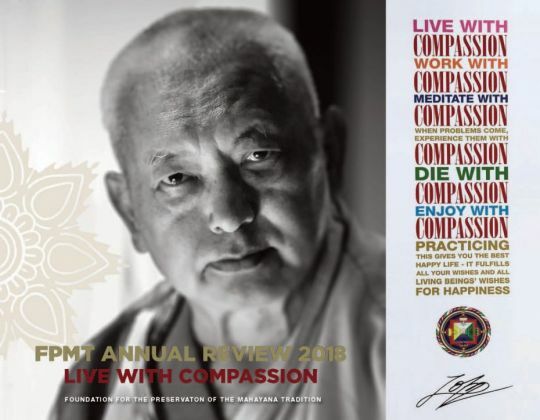 We are happy to announce our FPMT Annual Review 2018: Live with Compassion. Our new annual review is available to read as an eZine and a downloadable PDF. Written by Lama Zopa Rinpoche, Recognizing the False I, now in ebook and PDF formats, is a commentary on and set of simple meditation techniques for identifying the object to be refuted— what Rinpoche calls “the false I”—during reflections on emptiness. The text was specifically composed for students engaging in the self-generation portion—often called “the ultimate deity”—of kriya yoga tantric practices, such as nyung nas. The meditations can also be used by students during retreats on the Heart Sutra or any other retreat focused on emptiness. 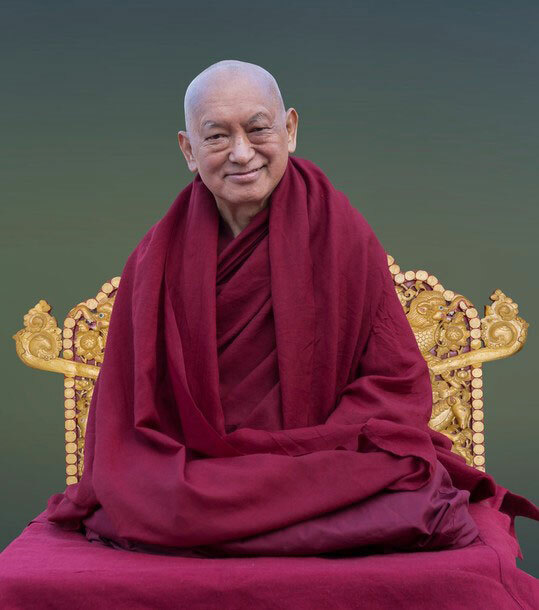 Additionally, Rinpoche offers these techniques to all students in general to help them meditate on emptiness correctly during their daily practices. Meditations on White Tara, now in ebook format. The practice of White Tara strengthens and restores good health and life-force energy. A Meditation on Orange Manjushri, now in ebook format, written by the Fifth Dalai Lama. 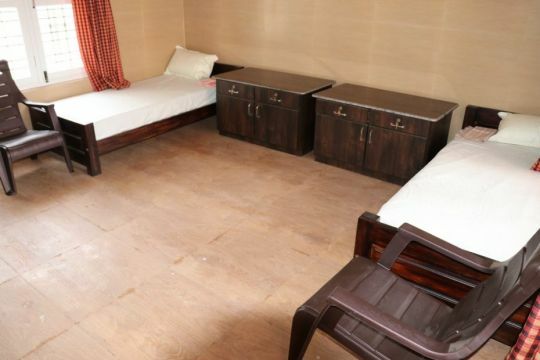 Thanks to the kindness of those who donate to the fund, the Social Services Fund offered grants to support the extension of Lugsum Samduling Home for the Aged and Disabled, Bylakuppe, India, which cares for approximately forty elderly Tibetan individuals. This enabled accommodation and prayer wheels to be added. Without homes like this, many elderly first-wave Tibetan refugees have very little prospect of accommodation or support, as many are without families of their own. Further, by supporting the creation of holy objects, FPMT is helping the elders to take ultimate care of themselves by providing the conditions for them to create merit for this and future lives. 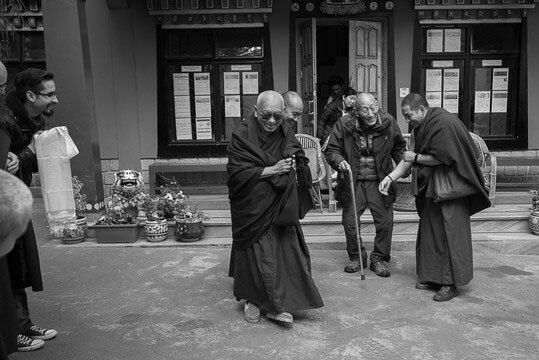 The Social Services Fund has been supporting elderly Tibetans in this way since 2015, and currently offers grants to six homes. Productive National Meeting in Mexico! 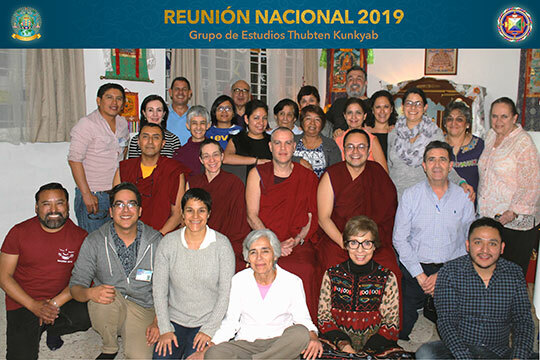 FPMT National Coordinator, Gilda Urbina, organized a very fruitful national meeting for the FPMT centers, projects, services, and study groups in Mexico. LRZTP 8 will finish in March 2020, followed by a two-month interpreting intensive. A two-month beginner level Tibetan short course will begin in April 2019. LRZTP 9, the next two-year course, will open in October 2020: advertising and registration for this course will start in the middle of this year. Would you like to spend your days in a very meaningful way? Have a look at the regularly updated meritorious opportunities to offer service as a volunteer or as paid staff in FPMT centers, projects, and services around the world. Newly added: Nagarjuna Center, Madrid, Spain is looking for a new director; Mahamudra Center, New Zealand, needs a spiritual program coordinator; Nalanda Monastery, France has many volunteer opportunities. Gonpo Ludup Study Group, USA, has closed.